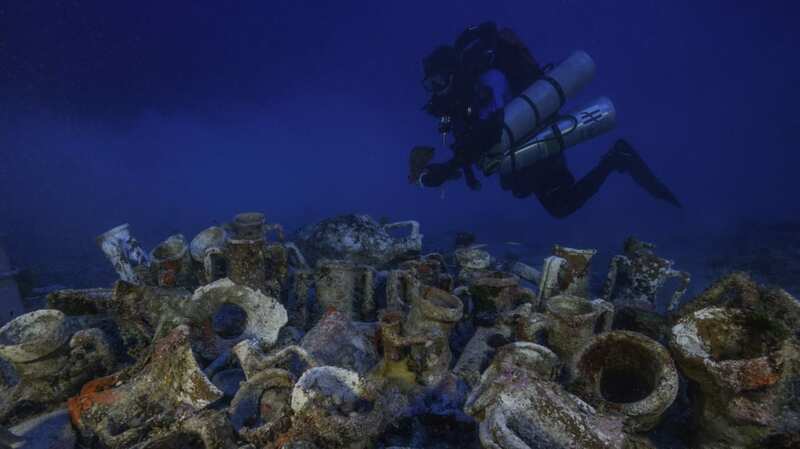 Diving operations manager Phillip Short inspects amphoras on the Antikythera shipwreck. Human remains are a rare find for sunken ships. Discovering a skeleton in one of the most famous shipwrecks in the world is even rarer. But that's what happened in late August in Greece, at the site of the Antikythera wreck, where the Antikythera mechanism, sometimes called the world's first computer, was discovered more than a century ago. The skeleton likely belonged to a young man who became trapped in the cargo vessel when it crashed into rocks and sank around 65 BCE. The largest ancient sunken ship ever found, the Antikythera wreck was first discovered by sponge divers in 1900 off the coast of the Greek island of Antikythera. Located about 150 feet below the surface on a steep slope of the sea floor, the site has yielded some spectacular finds, including coins, pottery, glassware, marble statues, and, famously, the Antikythera mechanism, a unique device used to calculate dates and astronomical events. A team of divers and marine archaeologists has been revisiting the site over the past several years to map what’s left of the wreck and look for other buried artifacts. They began their latest field season on August 31 with a rare discovery. “On the first dive of this season, within the first few minutes of hitting the sea floor, we found bone,” the co-director of the project, Brendan Foley, a marine archaeologist at Woods Hole Oceanographic Institution (WHOI), tells mental_floss. Buried on the sea floor among a mix of sand, rock, and a jumble of broken pottery, the array of skeletal remains included arm bones, both femurs, teeth, and several fragments of different ribs. Most of the skull was also uncovered, though not fully intact; it was fractured in different places and broke into several pieces once the sediment surrounding it was removed, Foley says. They believe the remains all belong to the same person. Because the femurs were quite robust and the teeth were not worn down too much, the team thinks the skeleton might have belonged to a young adult male, perhaps in his mid-20s. It might not ever be possible to say how this person died—whether he drowned or got crushed, for instance. But the researchers might be able to glean other information about this shipwreck victim if they can extract ancient DNA from the bones. Genetic sequences obtained from the skeletal remains could reveal ancestry of the individual, which could also shed light on the identity of the crew. Antikythera Project co-directors Theotokis Theodoulou and Brendan Foley inspect the skeletal remains: skull and upper jaw with teeth, two femurs, radius, ulna, and ribs. Skeletal remains have been found at more recent wrecks, such as the Vasa, a Swedish ship that sank on its maiden voyage in Stockholm in 1628, and the Mary Rose, a Tudor warship that sank into clay seabeds during a battle off the coast of England in 1545. Schroeder was brought to Greece to analyze the recovered remains earlier this month. The team is now seeking permission from the Greek authorities to get samples of the bones for a full suite of analyses, including an attempt at extracting ancient DNA.